Scare the boo crew that lands on your front steps with doors decorated like monsters, Frankenstein or mummies. Get creative with a witch wreath or spooky cobwebs. This list of fiendish ideas might make you wish you had more doors. 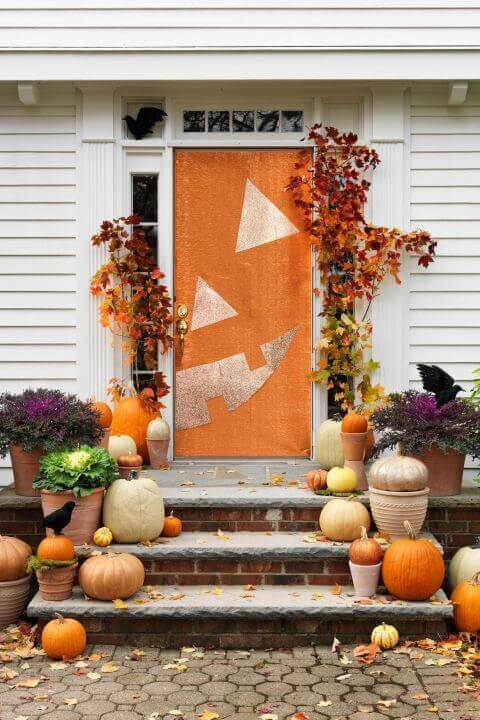 Add some Halloween magic to your porch this year by decorating your door. Have some Halloween fun with 9 Paper Plate Halloween Crafts. 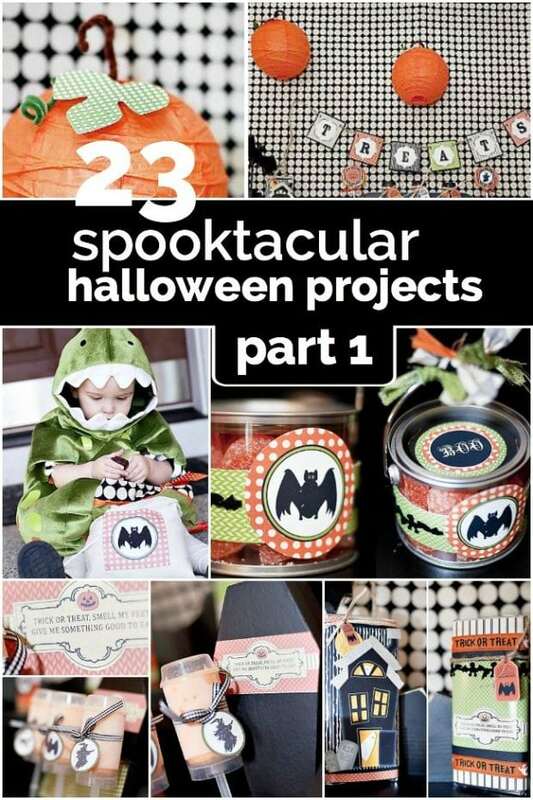 Keep kids busy with 11 Boredom Busting Halloween Crafts. Look at these 25 Spooky Halloween Drinks for Kids! More cute than creepy, this felt and paper version of Frank is most comfortable hanging around under a covered porch. 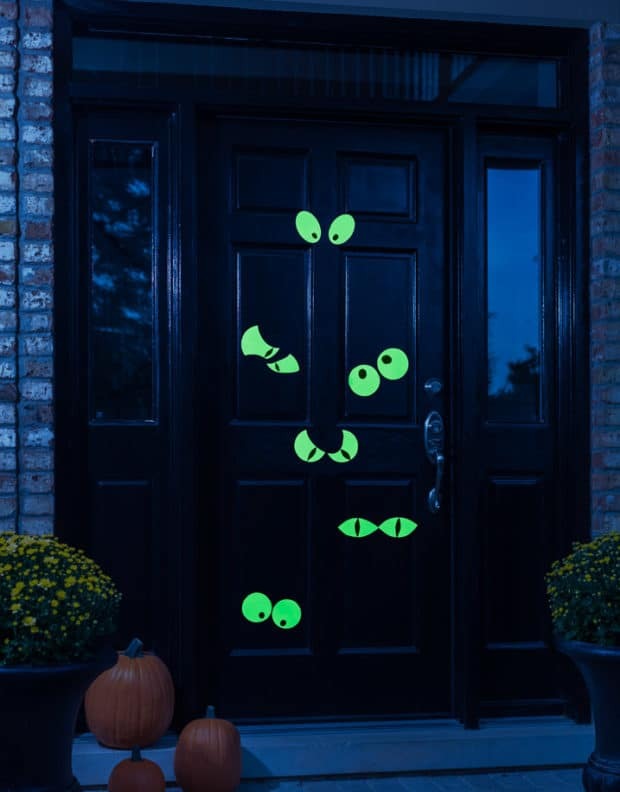 If you have a green door, this Halloween decoration is perfect for the outside of your home. If you don’t have a green door, you could always cover your door in a green plastic tablecloth, fabric, or paper. This project is easy enough to accomplish that your children can help. With kids helping to cut the crepe paper, this mummy inspired Halloween door decorating idea would be a wrap in no time. Here’s lookin’ at you, kids. While a variety of materials would work for this decorating idea (paper, fabric, felt, etc…), you will want to choose appropriate materials for the location of your door (inside vs. outside, exposed to the elements or not). Create eyes and a shadowed face, and simply criss-cross white strips to mimic mummy bandages. Poster paper and tape. That’s nothing to be scared about. 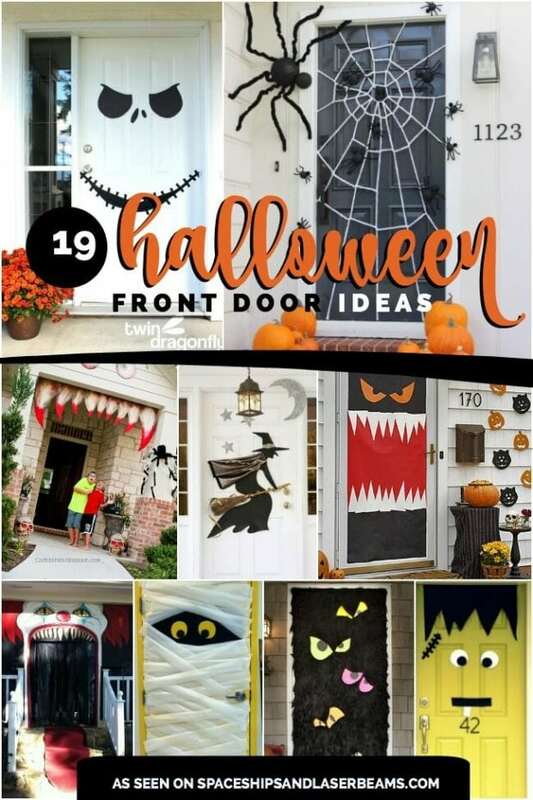 This monster Halloween door may be constructed from simple, non-threatening materials that are easily transformed into an awesome Halloween door decoration, but the door itself may be scary enough to keep some trick-or-treaters from knocking at your door. Which door should guests use? This one, of course! 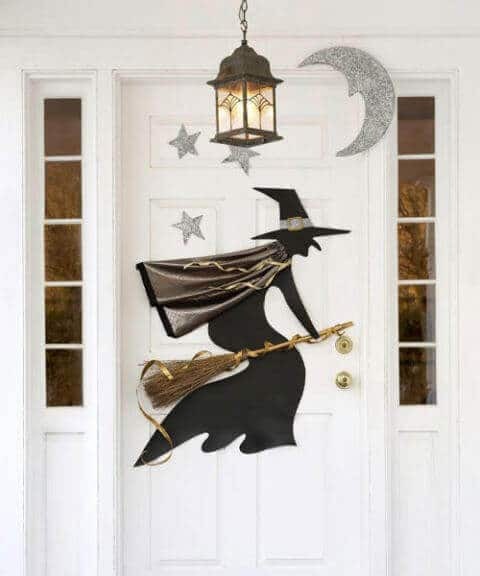 Halloween visitors will love seeing the resident witch flying on her broom with her cape trailing behind. What a fun Halloween door decorating idea! Vinyl and Styrofoam make it happen. Clowns are supposed to bring laughs and smiles, right? Not this clown. Something that should be for laughs doesn’t look so funny when it has spiked teeth—creepy. 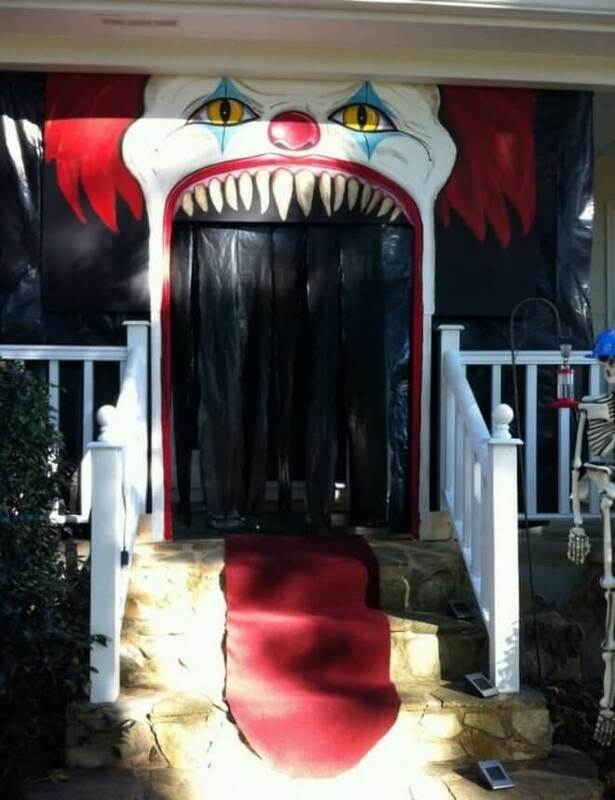 This creepy clown Halloween door isn’t for the faint of heart, but it is impressive. Check out the paint job. Plus, gotta admit, rolling out that “red carpet” tongue definitely gets your attention. 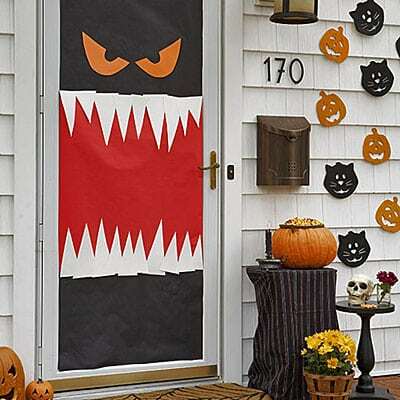 Make your house come alive this Halloween with a DIY monster teeth Halloween door. This monstrous mouth is brought to you by plywood, a little paint, and a crafty mama. To replicate this Halloween door decoration idea it will require using a saw, so be sure to proceed with caution. 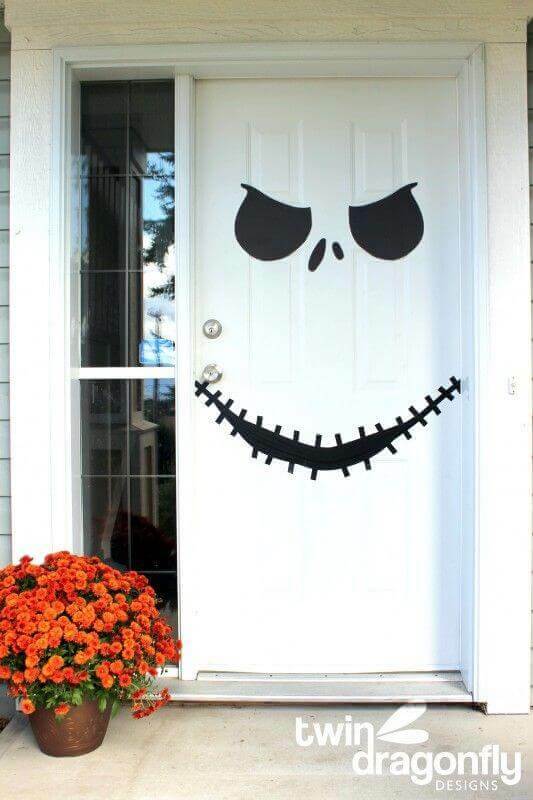 This Jack Skellington Halloween door is easy to make using a free printable template. And the supplies to recreate the look are simple too: paper and tape. So simple. So effective. Adults and children can participate in creating this fun Halloween décor. Would you dare to knowingly step foot into a coffin? How about if Halloween candy was at stake? 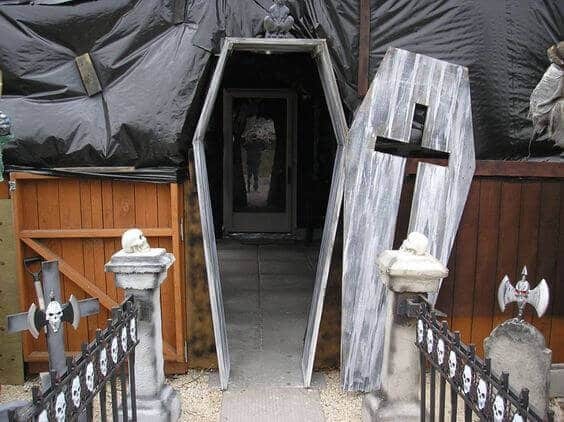 This coffin entrance, made from wood, takes unsuspecting Halloween party guests into the spooky unknown, all for the promise of a few treats. I don’t know about you, but I might keep a few tricks up my sleeves, just in case. 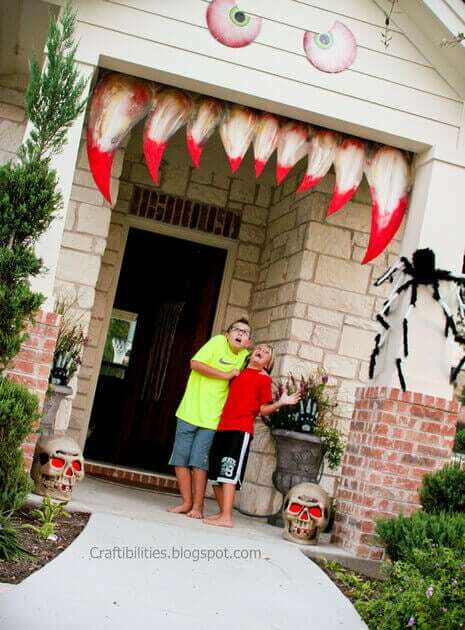 Some definite skills were used to create this awesome Halloween arch door entrance. 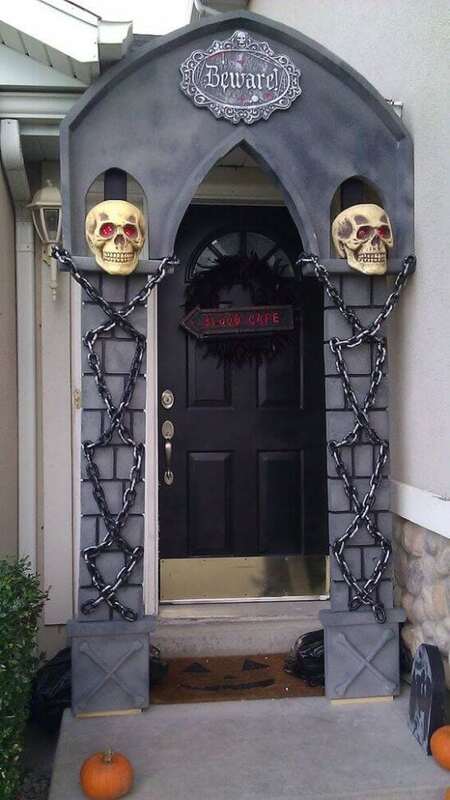 Made from a combination of routed Styrofoam and 2×4” backing, plus a list of other materials, this door decorating idea is not for those easily spooked, but definitely results in one massively cool Halloween decoration. Styrofoam never looked so impressive. 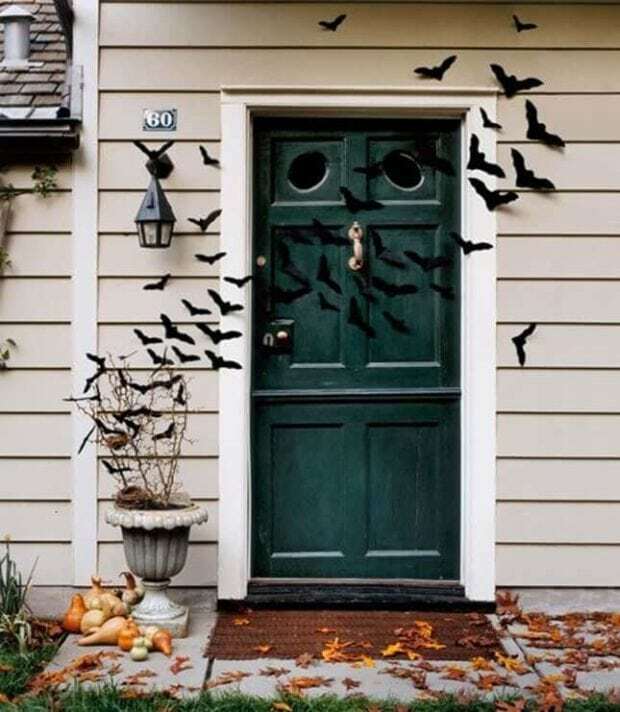 Make the exterior of your house look extra spooky by adding felt bats. They are easy to make using the provided free bat template. Just download the file, print the template, trace the shape on felt, and cut it out multiple times. Once you feel like you’ve gone batty, you’ll know you have enough to decorate your front porch and doorway. 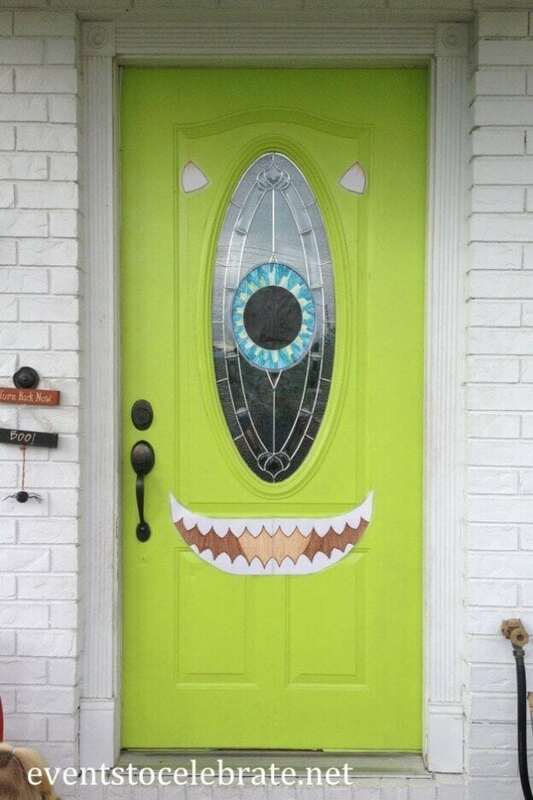 Mike Wazowski would definitely approve of this Monsters Inc. inspired Halloween door. We’re pretty sure Sully and Boo would too. A green door makes the perfect Halloween backdrop for this decorating idea. Poster paper and markers are used to add the Monster’s facial features, which happen to be all hand-drawn in this example. To create a look that will last, laminate the pieces to withstand the weather. Halloween visitors might second guess their trek to your front door once they see these troubling “Keep Out” decorations. Nothing like a warm welcome for guests. Check out the instructions to create your own version of this haunting door decoration. Add the quintessential look of a toothy jack-o-lantern to your front door and bring a smile to all your fall and Halloween visitors. This jack-o-lantern is one that you don’t have to carve, but you do have to cut wrapping paper. The look is easy to put together using orange gift wrap, gold glitter gift wrap, and double-sided masking tape. Include assorted pumpkins and collections of fall leaf branches to bring a beautiful autumn look to your porch. You won’t need to concoct a special magic potion to help with this DIY Halloween door decoration. 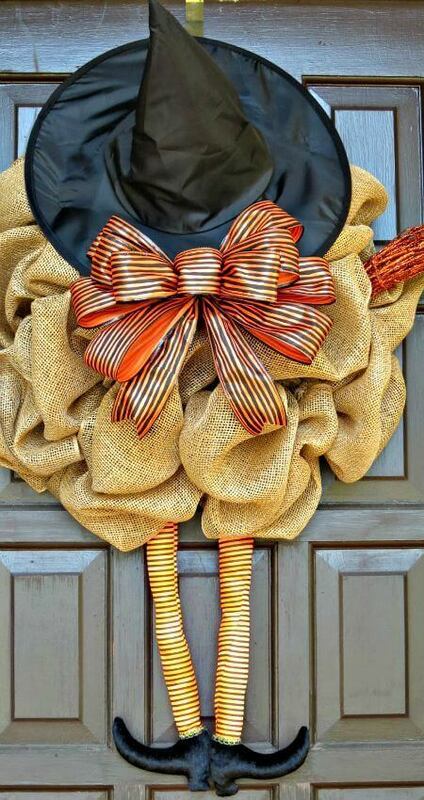 This Halloween witch wreath is easy to put together and makes a perfect front door decoration. The hardest part will be sourcing the materials, many of which can be found online. 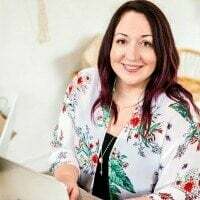 Here are the items you will need: broomstick, witch legs, witch hat, ribbon, floral wire, burlap colored wreath, and a roll of poly burlap mesh. Work your magic with these materials, and you’ll have a great witch to welcome guests to your home. Arachnophobia? 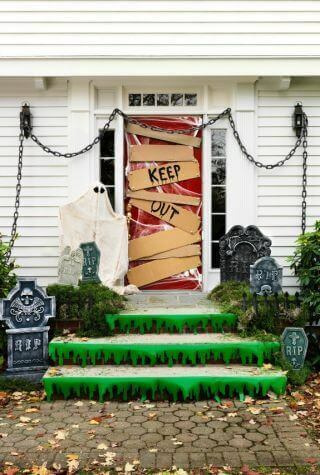 Your skin may crawl when you see this Halloween door decorating idea. Don’t get caught unaware…this spider is no itsy bitsy thing, and neither is her web. 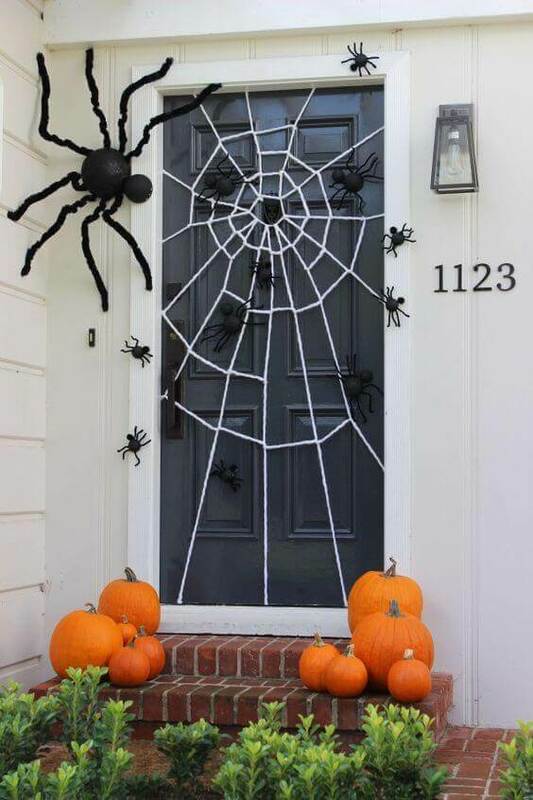 Use white rope to make your own version of this spider web-guarded Halloween door. Don’t forget to add a jumbo spider and her family of babies. Want to costume your door for Halloween in a truly monstrous way? 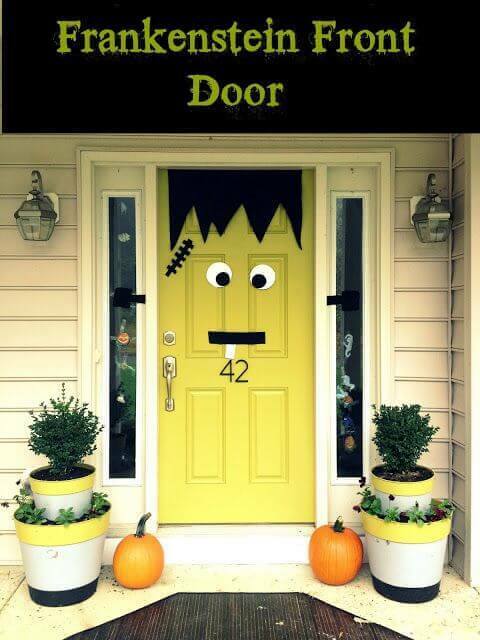 We’ve got our eyes on this awesome Halloween door decorating idea. Using the provided eye template—which you can download for free—enlarge to various sizes, print, and cut. The eerie eyes really pop when they’re arranged on black faux fur. 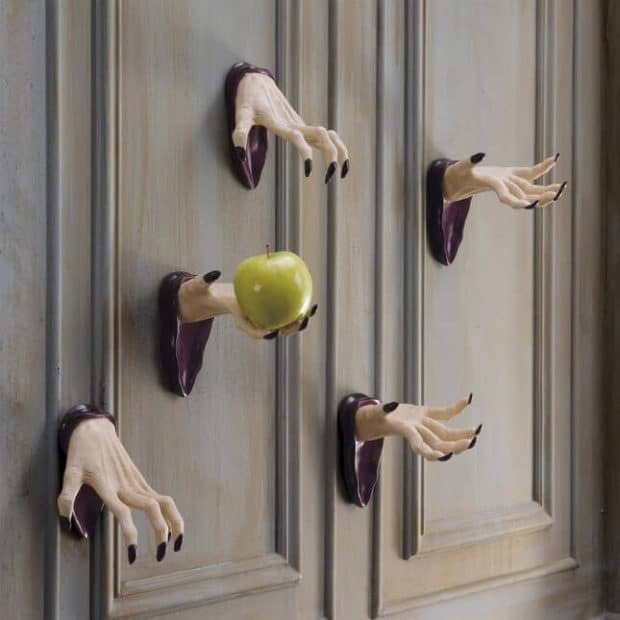 I can’t quite put my finger on it, but for some reason, this poison apple Halloween door is pretty spooky. If suspended body parts give you the creeps, here’s your poison. Trick-or-treaters will have to reach past all of these hands, overcome fears, and knock on the door to earn their Halloween treat. Could you do it? 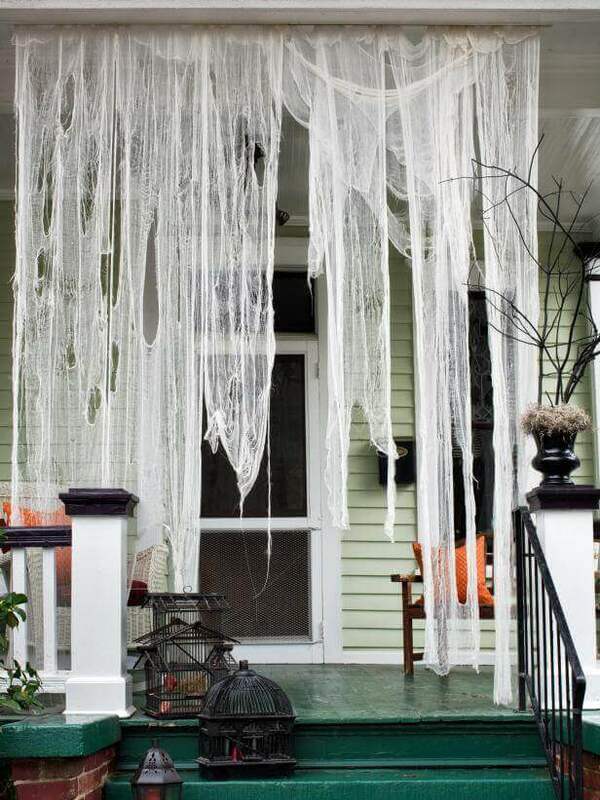 Add some spook to your front porch by creating ghostly cobweb draperies to hang from the rafters. 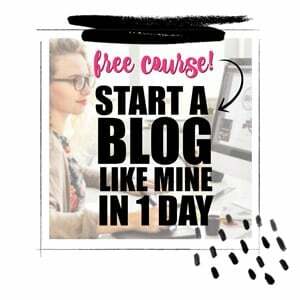 You’ll need several yards of cheesecloth, strips of poplar, and some construction tool basics (staple gun and staples, scissors/utility knife, tape measure, mitre box and saw), plus hot water, a bucket and bags of tea. Are you a movie buff? 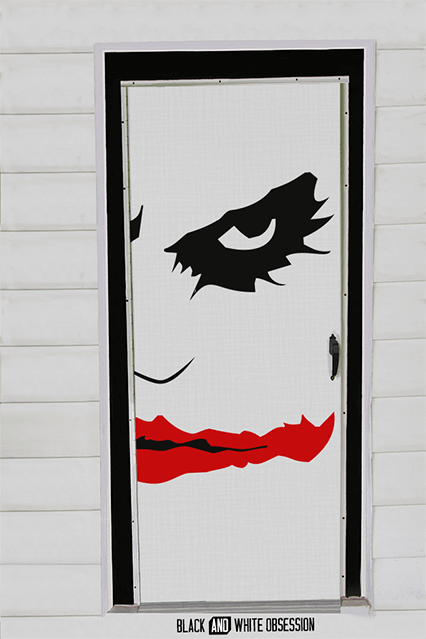 Why not decorate your door for Halloween based on a favorite movie theme? This The Dark Night Halloween door is easy and inexpensive, but big on impact. Would you believe the door is covered in a $1 tablecloth, and the details are created from poster board and acrylic paint?